This Israelite-Samaritan weekday prayerbook includes blessings for washing before prayer, the text of the Samaritans’ two daily prayers (evening and morning), and their nusaḥ for counting the ʿOmer between the first Sunday of Pesaḥ and the holiday of Shavuʿot. This file is all in Samaritan script, an offshoot of paleo-Hebrew which developed after the Jews had already switched to today’s square “Ashurit” script.Israelite Samaritan’s call “Ashurit” script, Aramaic Hebrew script At the end of the prayerbook, I’ve added a short pronunciation guide for those familiar with English or modern Hebrew. NEW: You can now download the prayerbook transliterated into modern Hebrew characters (“Ashurit”). The text is completely vowelled according to the Samaritan pronunciation. The prayerbook is available either as an editable Open Document file, or as a PDF file. 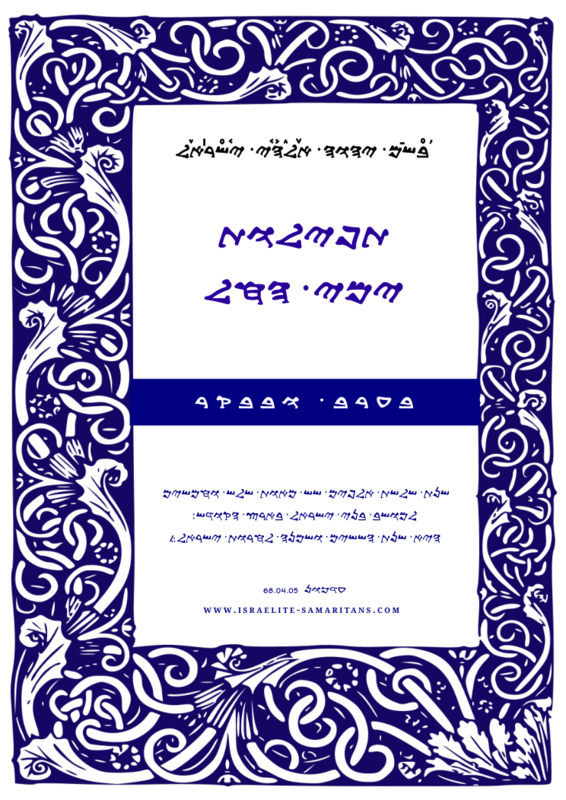 Both the original prayerbook and the transliterated version have been proofread and corrected by Benyamim Tsedaka, a scholar and spokesman for the Israelite-Samaritan community. “The Samaritan Prayerbook for Weekday Evenings & Mornings” is shared by Uri DeYoung with a Creative Commons Attribution-ShareAlike 4.0 International copyleft license. Please reciprocate for any adaptation or redistribution of this work by (1) properly attributing the work to Uri DeYoung and Benyamim Sedaka, (2) clearly indicating the date you accessed the resource and whether any changes have been made (and if so, please be in touch with us and leave a comment below so that we might note your adaptation or improvement), (3) providing a link back to this source, and (4) specifying the Creative Commons Attribution-ShareAlike (CC BY-SA) 4.0 International copyleft license under which this work was shared. 2015-05-17 – 29 Iyyar 5775 at 5:06 pm · Reply. Shalom, will you publish in English also? 2015-05-17 – 29 Iyyar 5775 at 11:40 pm · Reply. 2015-05-18 – 1 Sivan 5775 at 5:51 am · Reply. 2015-06-08 – 22 Sivan 5775 at 10:03 am · Reply. Shalom, could you please help me with a word thats in the defter old translation? 2015-06-09 – 23 Sivan 5775 at 3:05 am · Reply. Let me know what the word is and on what page it appears. 2015-06-11 – 24 Sivan 5775 at 9:07 am · Reply. Thank you very much. Its okay, i will use your translation instead. Where will you publish the updates? I can’t promise quick updates, but I’ll try to keep up on it. 2015-05-18 – 1 Sivan 5775 at 2:29 pm · Reply. Oh ok, i really need it in English. 2015-06-18 – 2 Tammuz 5775 at 2:22 am · Reply. 2015-06-18 – 2 Tammuz 5775 at 8:14 am · Reply. It seems to be. You could ask the expert, Benyamim Tsedaka. He’s on Facebook and he has a nice website at http://www.israelite-samaritans.com/benyamim-tsedaka/. He can give a definitive answer. 2015-07-13 – 26 Tammuz 5775 at 12:31 pm · Reply. Shalom, How is it going with the translation? 2015-07-13 – 26 Tammuz 5775 at 7:10 pm · Reply. At Benyamim Tsedaka’s request, I’ve been concentrating on the transliteration into modern Hebrew. Because the original was typed using the UFT-8 Samaritan code page, I couldn’t simply change the font; I’ve had to retype the entire thing. It’s not a lot of work, but I’m adding niqqud that approximates Samaritan pronunciation and I work slowly. The English version will be my next project. Additionally, I’m sure that someone will take it upon himself to translate it into Portuguese, as there’s an active group of Brazilians who are eager to learn more about Samaritan customs. 2015-07-14 – 27 Tammuz 5775 at 1:35 pm · Reply. Do you think the English translation will be done this year? 2016-02-15 – 6 Adar I 5776 at 2:40 pm · Reply. 2015-09-04 – 21 Elul 5775 at 9:17 am · Reply. 2015-09-17 – 5 Tishri 5776 at 12:36 pm · Reply. Are you planing on doing The hebrew transliteration with roman characters and english beside? 2015-09-19 – 7 Tishri 5776 at 4:53 pm · Reply. i cant believe my eyes….I have a deep fascination with Samaritans whom I believe are the remnants of the Ten Tribes specifically the Tribe of Joseph. This is a beautiful project. I hope to buy it soon. 2015-09-19 – 7 Tishri 5776 at 7:22 pm · Reply. There’s nothing to buy. Just download the free PDF file(s) and print them up.